Around October 2012 the US high-energy physics (HEP) community and funding agencies started a strategic exercise to create a roadmap for the future of high-energy physics in the USA. The first step was the initiation of the Snowmass process to review the complete science status of the field. 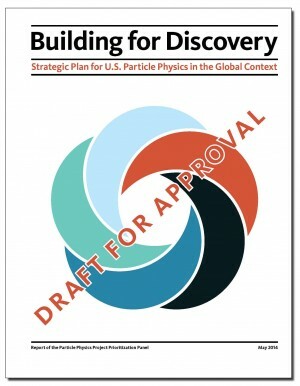 After Snowmass, the Particle Physics Project Prioritization Panel (P5) was put together and charged by the High Energy Physics Advisory Panel HEPAP to create a roadmap for the US programme. It is important to remember that P5 is a subcommittee of HEPAP and reports to HEPAP. The high-energy physics community was involved in all stages of this process and invited to give input and comments. Colleagues from around the world joined in as well to report on their strategies. At the meeting at Brookhaven National Lab in December 2013 the American linear collider community provided input to P5 and outlined a possible plan for a US contribution to the ILC in Japan. An overarching consideration in this talk and in the final report discussed today at HEPAP is that “Particle Physics is global”. This is already reflected in the P5 process, which involves significant regional involvement and thus has a very global approach. The complete committee report was presented to HEPAP today, 22 May 2014, and discussions about its content were ongoing as this article was written. Steve Ritz made the presentation to HEPAP. His talk can be found here. The P5 roadmap outlines a broad particle physics programme for the USA which addresses all the science drivers mentioned above. Here we will concentrate on and single out the parts of the roadmap that involve the ILC in Japan. The report has a total of about 29 recommendations and there are two which are directly relevant to the ILC in Japan. This is a very strong endorsement of the ILC programme. It is another step towards realising the ILC and a potential US contribution. This is a reminder that the financial scale of the ILC in Japan is such that high-level political agreements need to be established between the host country and the US side before “higher levels of collaboration” can be considered in the USA. A link to the complete P5 draft report can be found here. Officially HEPAP still needs to approve the report and hopefully that will happen after the discussion either today May 22 or tomorrow. Many thanks for the timely “Director Corner” article, this week.